A touch of chilli sauce adds extra oomph to this classic Canadian recipe. 1. Combine flour, baking powder, sugar and salt in a bowl and make a well in the centre. 2. Beat or whiz the buttermilk, eggs and melted butter until smooth. Pour the buttermilk mixture into the flour mixture and bring together with a whisk without over-mixing. It's okay to leave it a bit lumpy. 3. Melt one teaspoon butter in a 20cm frypan, swirling to cover the base. Add 100ml batter, and cook over medium heat until bubbles appear on top, about two minutes. Gently turn and cook until golden, about one minute. Keep warm while making remaining pancakes. 4. Heat the maple syrup, chilli sauce, butter, sea salt and pepper in a small pan until boiling, stirring well. 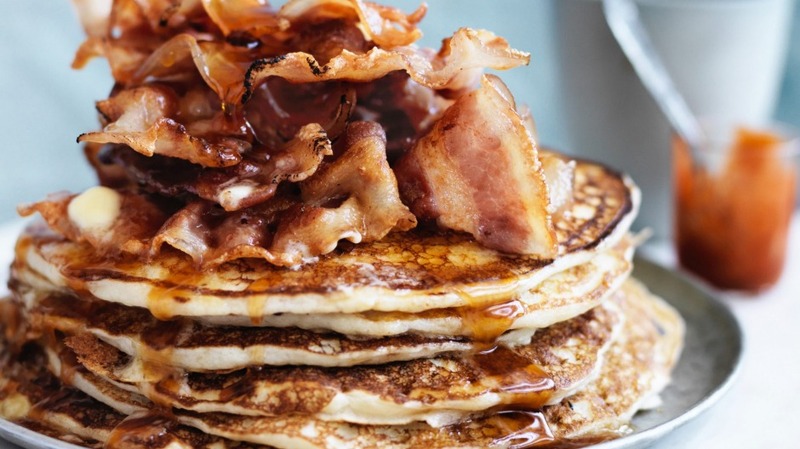 Stack two pancakes on each warm plate, top with fried bacon and pour the Sriracha maple syrup over the top.